I’m an army brat. I grew up around the army. Later, I did about 4 years in the army, where I met my husband. I am army wife. Now I’m an army mom. I’ve been all over the place with my family, and wanted a way to show all the places we’ve been. For years, I’ve seen the plaques with pendant boards hanging down, listing each duty station (like this), but I wanted to see if I could do something a little different. My husband & I met when we were both stationed in Hawaii. We got married there, and when I got out, I worked as a photo editor/graphic artist for King Digital in Honolulu. The photo paper they used came on these large thick cardboard “toilet paper roll” tubes, which they sent out for recycling. Before we PCSd, I was able to get a few of them to take with me. I didn’t know what I wanted to do with them at the time, but they were calling my name. They looked REALLY fun to paint on. I decided to make each tube a sort of painted collage of the things we had done at each duty station, the things we remembered most about it. 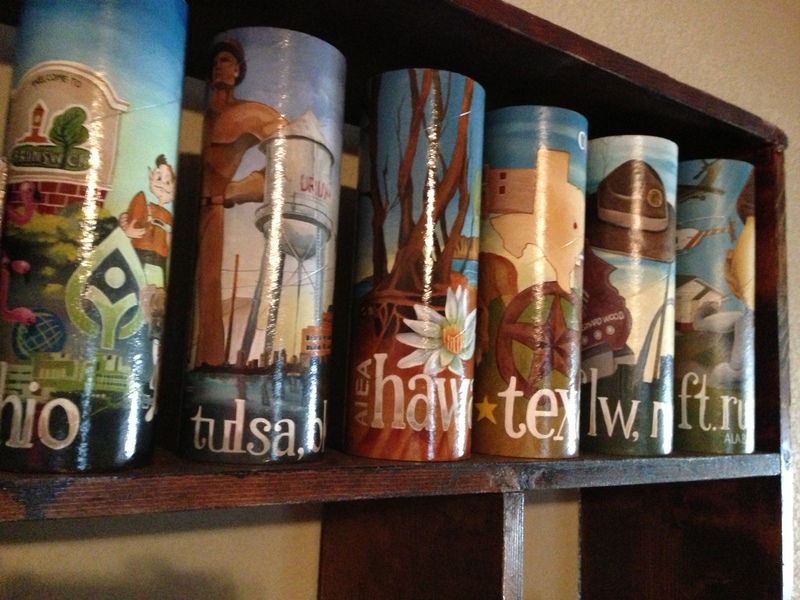 My husband and I have fun trying to choose what will go on each tube. 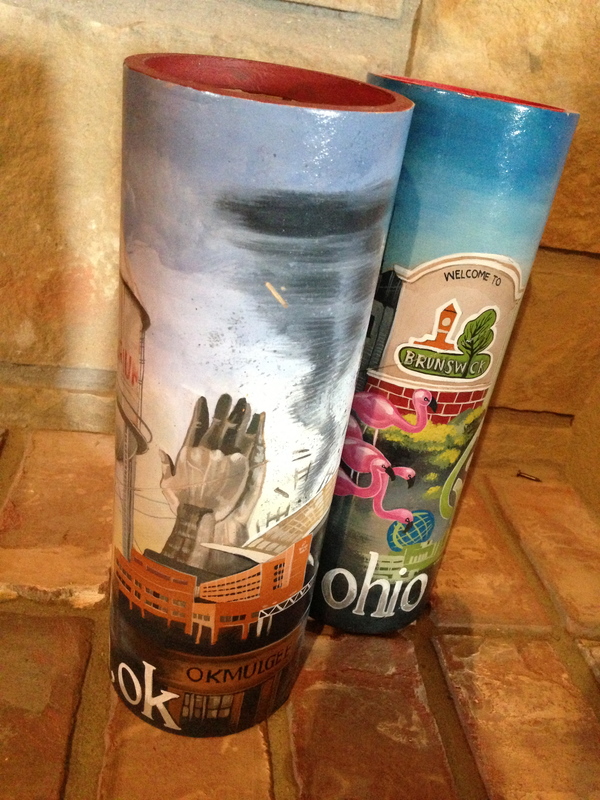 I started with one for Oklahoma (where I was born) and one for Ohio (where he’s from). We’ve got a good collection going! Only now….I can’t seem to find the “toilet paper roll” tubes anymore! I’ve run out! I have a couple of smaller ones, but none like these. I was even the crazy lady, asking for them at Wal-Mart’s photo lab. I can’t seem to find any anywhere! So I’m going to keep looking. I’m running behind, though, since I try to do one after we leave each duty station. We left Alaska several months ago…so we’re due for a new tube! In the meantime, share your stories! If you’re a family that moves around a lot, is there a special way you commemorate your duty stations, or the places you’ve lived? Do you frame a photo? Make a list of license plates? I’d love to hear your ideas! What are the sizes? I’ll ask around! Oh thank you! These are 10″ high with a diameter of about 3 and a quarter. They’re pretty big! And they’re made of a thick cardboard, very sturdy; not flexible. I’d appreciate any leads!